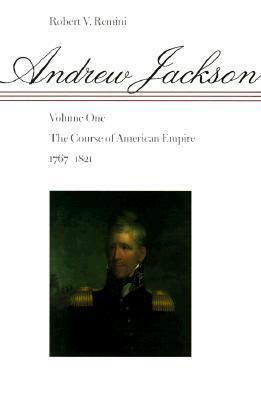 “Andrew Jackson: The Course of American Empire (1767-1821)” is the first of three volumes in Robert Remini’s series on Andrew Jackson. This first volume was published in 1977 and the series was completed seven years later. Although highly regarded, the series does not seem widely read. Remini’s 1988 single-volume abridgment of the series, however, remains quite popular despite the publication of more recent biographies of Jackson. Remini was a historian and professor at the University of Illinois and authored several biographies during his forty-year literary career (of John Quincy Adams, Henry Clay and Martin Van Buren, among other notable figures). However, he was best known for his exhaustive study of Andrew Jackson. Remini died earlier this year at the age of 91. This initial volume of Remini’s series focuses on the first fifty-four years of Jackson’s life – from his youth through his service as governor of the new territory of Florida. This swath of his life also encompasses his service in the American Revolution, his work as a lawyer and frontier prosecutor, his representation of Tennessee in Congress, his time spent as a judge and his extensive – and highly conspicuous – service as a military leader. Remini’s first volume provides spectacular insight into Jackson’s turbulent, tempestuous and wonderfully colorful personality. Superbly described is Jackson’s rise from an unrefined but intuitive frontiersman to a budding local politician and, finally, to a respected and successful (and frequently abrasive) Major General. Jackson’s numerous military campaigns (variously against the Indians, the British and the Spanish) are very well detailed and almost beg to form the basis for a movie script. Although Remini clearly admires Andrew Jackson, he frequently calls out “Old Hickory” for his unrestrained behavior and his treatment of Indians. And despite Jackson’s notable military victories (particularly at the Battle of New Orleans) Remini often criticizes failures in General Jackson’s tactics or oversight. But despite this balance, Remini fails to hold Jackson accountable for his views on slavery – a not uncommon feature of most biographies of early American presidents. Overall, the first of Robert Remini’s three volumes on Andrew Jackson is captivating, marvelously humanizing and remarkably penetrating. It quickly exudes the feeling of a David McCullough narrative combined with a Joseph Ellis character analysis, and Andrew Jackson seems a perfect choice to play the starring role in a thrilling biography. Imbued with an ideal balance of fact, analysis and opinion, and appropriately comprehensive in scope, “Andrew Jackson: The Course of American Empire” is a perfect start to what I hope is a consistently excellent series on Andrew Jackson. I am amazed at how quickly you crank out these articles. You must be a fast reader! Like Malone’s study of Jefferson, Remini’s is the best, but requires patience. You’ve convinced me. I will read Robert Remini’s take on President Jackson. I wonder why these biographers stayed away from the slavery issue with this President. Fantastic! Can’t wait to hear what you think. I should be on to Remini’s single-volume bio of Jackson in the next couple days. I’m interested to see how it compares to the three-volume series which has proven quite solid.